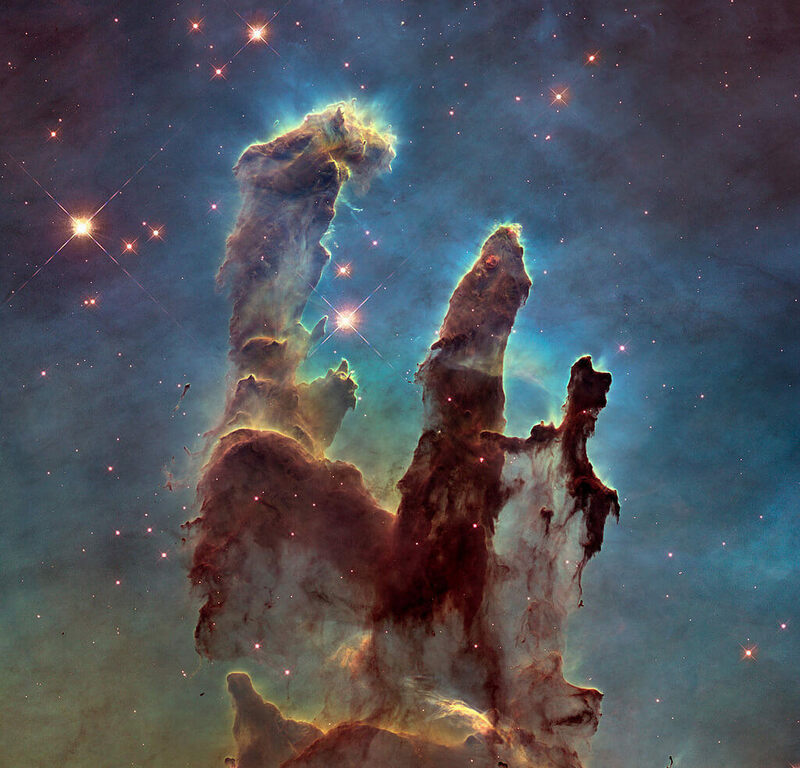 The Hubble Space Telescope’s cameras take individual images for different wavelengths of light and then astronomers combine them to create space images like these. The individual frames themselves aren’t in colour, but by combining images taken through different filters and giving each one a colour they can make the amazingly detailed space pictures we all know and love. This is star cluster NGC 346. The black and white image on the left reveals some of the nebula’s structure, but it really comes to life in the colour image on the right, which is a combination of optical and infrared wavelengths. The picture on the left is a mixture of three different wavelengths of light that are visible to the eye. On the right, infrared wavelengths (that you wouldn’t be able to see) are coloured red and green, highlighting features of the galaxy that would otherwise be invisible. On the left is Hubble’s image of the Pinwheel Galaxy (also called Messier 101) in visible light. The right shows Spitzer’s image of it in infrared. The red patches in the infrared image show regions where tons of hot, young stars are forming. The blue haze on this image of a massive galaxy cluster known as El Gordo is actually a mass map that shows where dark matter is lurking within it. Scientists figured it out by looking at how galaxies in the image are distorted by the dark matter’s gravity. X-ray observations from 2011 are shown in pink and helped scientists work out that the cluster was unusually big for its time. According to NASA, it’s actually a merger between two smaller clusters. In conclusion, look at all the staaaaaaars.